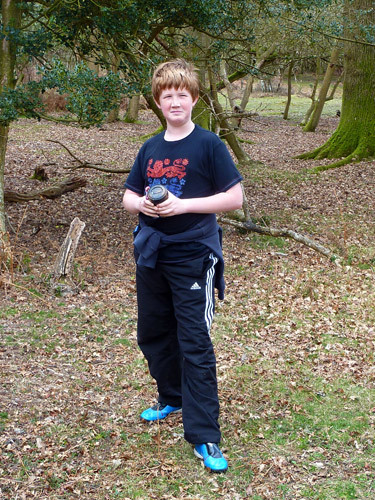 A geocaching walk with some history thrown in! 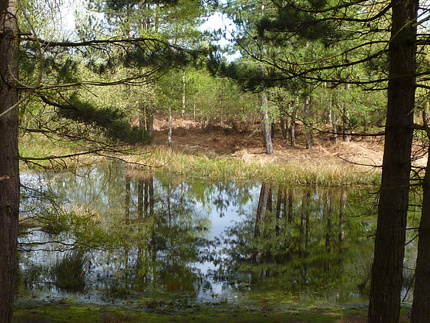 At the start of our walk we pass this delightful pond. Jon and Nathan share a quiet father – son moment. 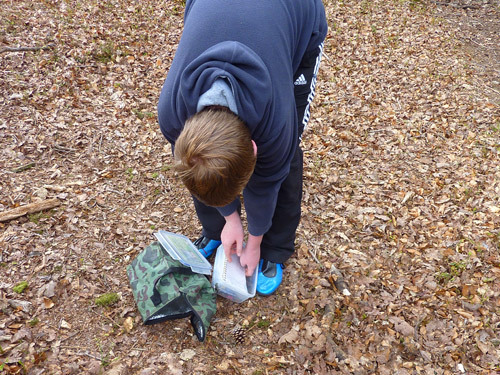 Using the GPS coordinates, the first geocache is found easily, Nathan opens up the box to see what goodies are inside. Sadly, no good swaps presented themselves here. 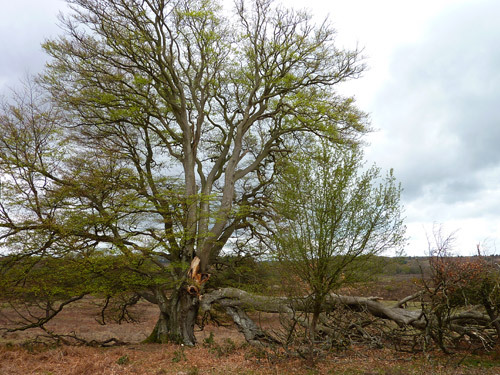 We’re following the edge of Highland Water and Puckpits Inclosures, a mix of woodland including many giants like this beech which has obviously suffered some major damage. 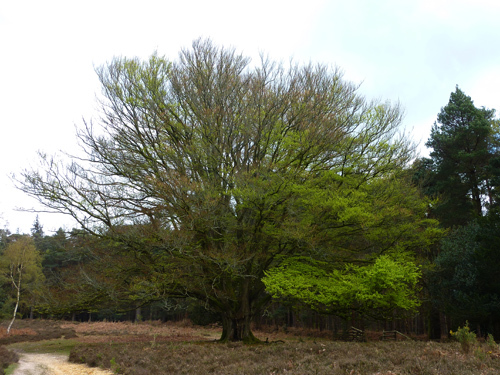 This beech is undecided, one half is clothed in it’s spring mantle, the other still in winter! 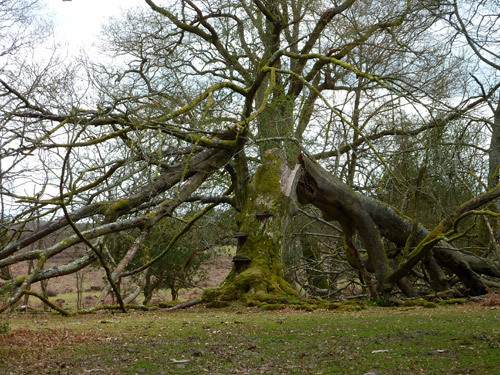 We saw quite a few trees along this path that had suffered some sort of weather damage, this is another of them. 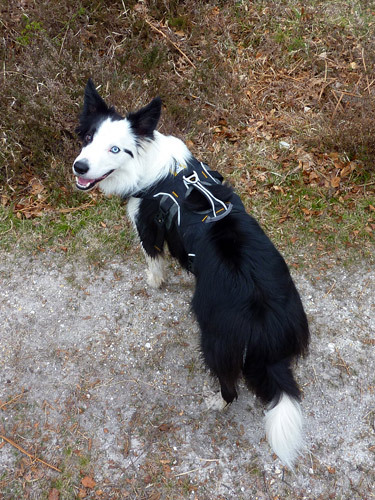 Harry, normally off the lead in the Forest, is in training to be on his harness and long lead ready for the Lakes at the end of May. Unfortunately, his breeding will out around all those sheep on the fells. Minus lead here for a little while so that he can stretch his legs. 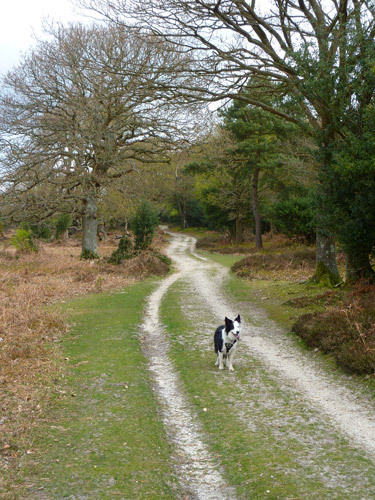 Taking advantage of his lack of lead, Harry races ahead and waits for us to catch up as we wend our way along this lovely path. Our instructions for the next cache tell us to turn left at Stonard Wood to cross Murrays Passage across Withybed Bottom. 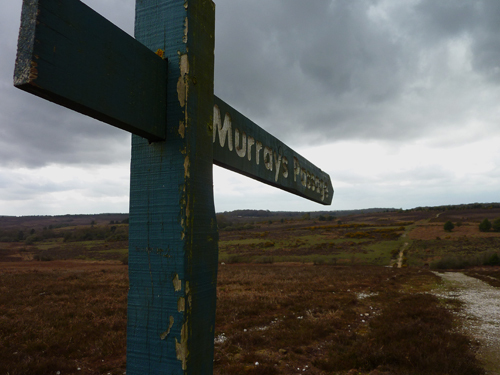 A signpost, an unusual thing to see around here, tell us we’re going in the right direction. 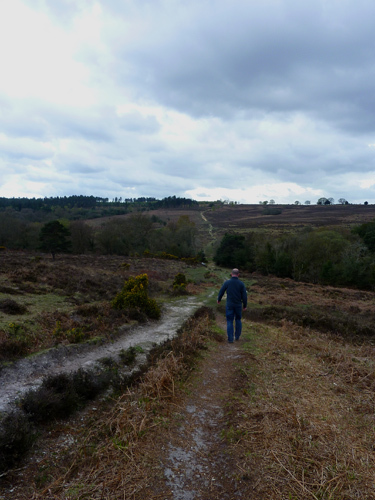 Locally, a passage is a safe route across a boggy valley or ‘Bottom’. Murray’s Passage crosses Long Brook and leads to the model boat pond on the hill beyond. The passage is named after an Admiral Murray who was killed whilst out hunting in 1901. 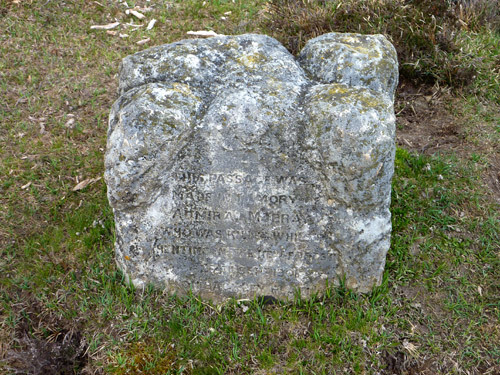 The passage was constructed using money donated to his memory and this stone has been placed as a memorial. At the model boat pond we found a couple of enthusiasts. One with a very, very, very noisy and fast speedboat and the other, which I much preferred, with his handbuilt replica boats. 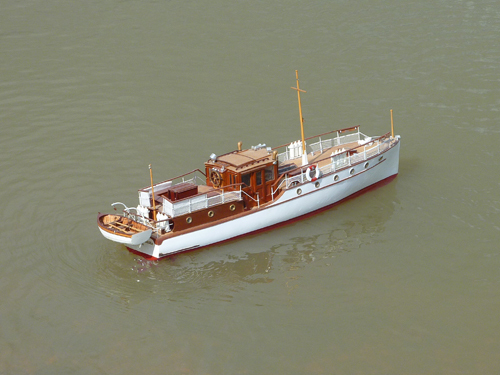 The gentleman, Brian Severn, told me that not only was the Bluebird built for Sir Malcolm Campbell, father of Donald Campbell, hence the name Bluebird, but also that she was also a member of the flotilla of ‘Little Ships’ that mounted the amazing rescue from the beaches of Dunkirk during the war. 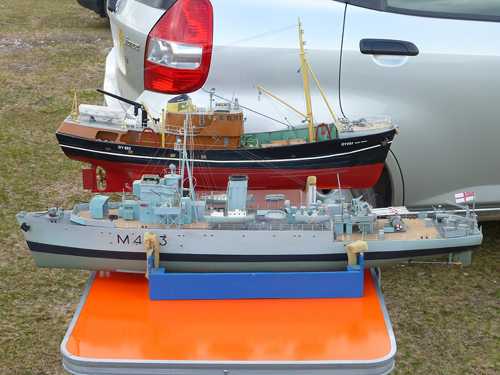 Find out more about Brian’s wonderful model craft at the Solent Radio Control Model Boat Club website. Two more of Brian’s boats in dry dock. 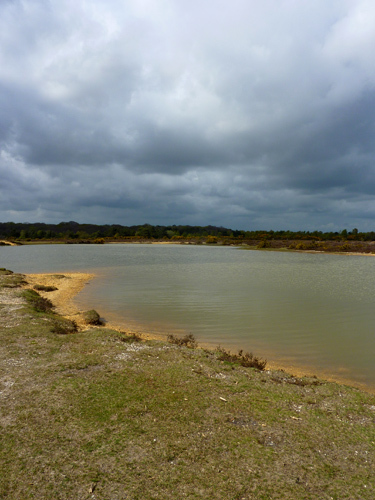 The lake with rather menacing looking clouds gathering. We say goodbye to Brian and his wife and head over Lucas Castle (not actually a castle, but high ground and a good viewpoint) and the second geocache site. The second geocache is found and logged. 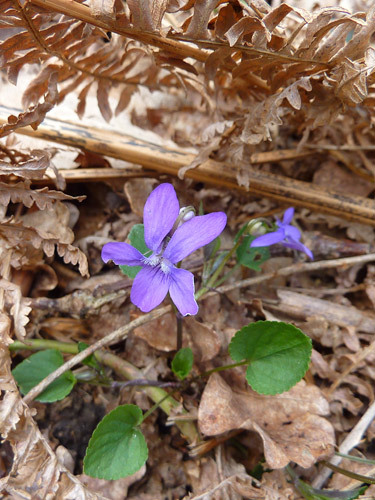 A violet nestles in the leaf litter – more signs of spring advancing. Striding out, the path leads us directly back to the Canadian Memorial which is in the line of trees on the skyline. 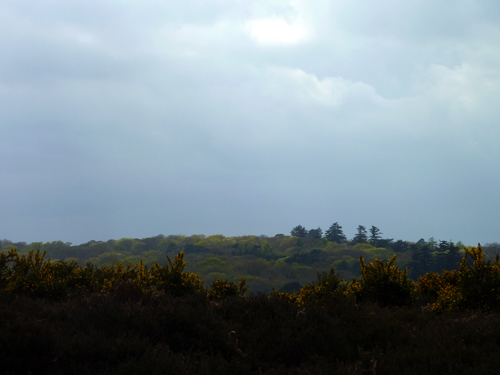 The colourful gorse in the foreground and the varying greens of trees coming into leaf behind cast with an odd light by the sun and thickening cloud. 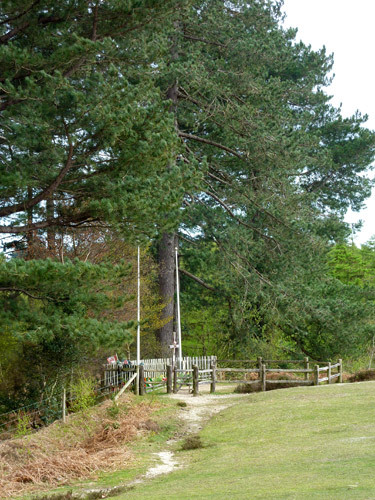 The Canadian Memorial – a simple wooden cross close to the Bolderwood Ornamental Drive. 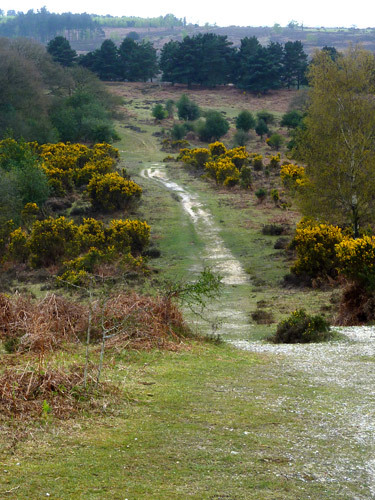 It honours the World War 2 Canadian forces present in the New Forest before the D Day invasion of June 6th, 1944. The inscription reads: On this site a cross was erected to the glory of God on 14th April 1944, by men of the 3rd Canadian Division RCASC. Hi, I did this exact same walk with my black lab, diesel, this afternoon! We came at it from milliford bridge which is further down the Canadian memorial road. Everything was exactly the same apart from the colours. My walk was full of bright green. Really loved your photos. Great walk! Thanks for your message Debbie. It’s a grand place, and usually very quiet too. 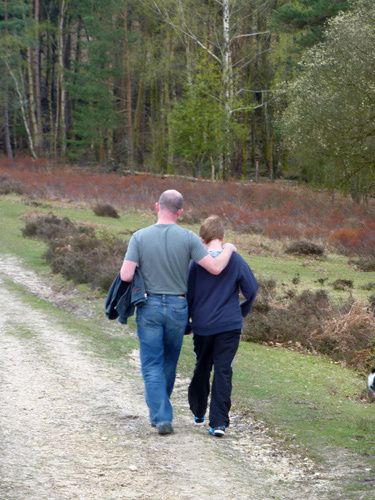 I’m planning to do the walk again in the autumn when I’m sure that the colours will be spectactular!